Product #21331 | SKU 486962 | 0.0 (no ratings yet) Thanks for your rating! 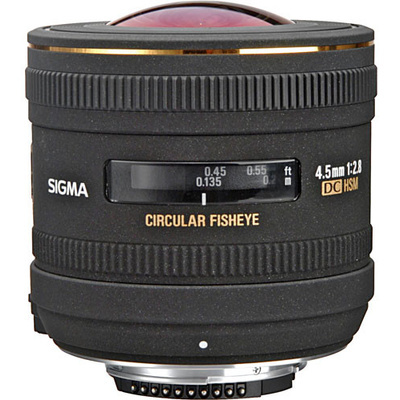 Offering creative distortion and exaggerated perspectives, the Sony A-mount 4.5mm f/2.8 EX DC HSM Circular Fisheye Lens from Sigma produces a circular image with an expansive 180° angle of view. Benefitting the unique look of the lens is an advanced optical design that utilises one SLD glass element to reduce colour fringing and chromatic aberrations for improved clarity, as well as a Super Multi Coating to suppress lens flare and ghosting. Additionally, the lens also features a Hyper Sonic Motor for quick and accurate autofocus performance for working with subjects as close as 13.5 cm away. Unique 4.5mm f/2.8 circular fisheye lens is designed for APS-C-format Sony A-mount DSLRs where it provides a 6.75mm equivalent focal length. Expansive 180° angle of view pairs with the fisheye design to render circular imagery within a black frame. This design also renders scenes with exaggerated distortion and curved lines for a creative, true "fisheye" aesthetic. One SLD glass element is featured in the optical design to reduce chromatic aberrations and colour fringing for improved clarity and colour accuracy. Super Multi Coating has been applied to individual elements to suppress flare and ghosting for improved contrast and colour when working in strong lighting conditions. Hyper Sonic Motor autofocus system, and an internal focus design, offer fast, precise focusing performance for working with subjects as close as 13.5 cm away. Rear slot accepts cut, insertion-type gelatin filters.